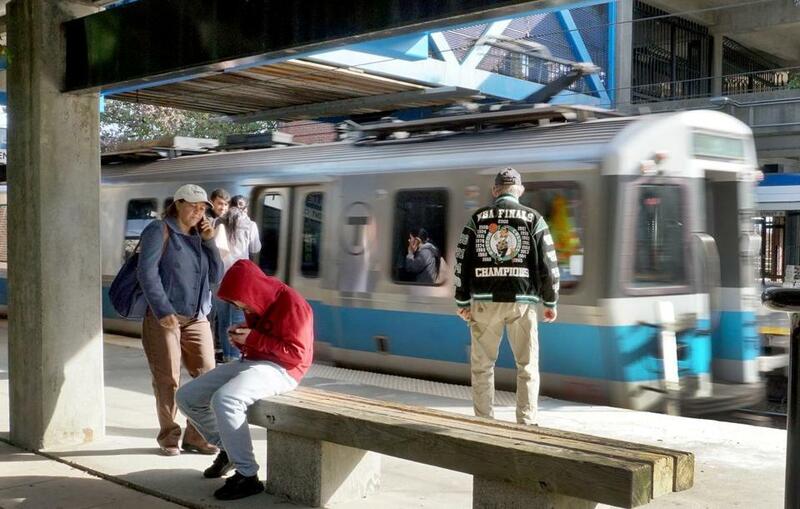 Passengers wait on the platform as an MBTA Blue Line subway train arrives at the Suffolk Downs station in East Boston. With MBTA fares likely to increase next year, Boston transit advocates are campaigning for a discount that could benefit tens of thousands of low-income riders. Inspired by a similar push in New York City and the new fare technology that’s coming to the T, the activists see an opportunity to help needy passengers. Should the transit system adopt a discount similar to the one planned in New York, which is expected to use the federal poverty line as a cutoff, some 150,000 local residents could get a huge break on their transit costs, the activists say. The Massachusetts Bay Transportation Authority has increased prices three times since 2012, and officials have hinted strongly they will consider another fare hike in July 2019. Today, subway rides cost $2.25 with a CharlieCard, and bus rides $1.70. Commuter rail trips depend on distance, from $2.25 for the shortest one-way rides to $6.25 for travel to nearby suburbs and up to $11.50 or more for more distant trips. The technology is common at airports, on Asian subway systems, and increasingly in Europe. But it has not been deployed on a major US transit system. The T already discounts fares by half or more for students, those 65 and older, and riders with disabilities — $1.10 for the subway, and 85 cents for a bus ride. Monthly passes, which usually cost $84.50, are discounted to $30 for eligible riders. State law limits MBTA fare hikes to 7 percent at any one time, so after the next increase, the subway could cost no more than $2.41 with a CharlieCard; the bus no more than $1.87. In 2015, the T took a major step toward income-based fares with a discount program called Youth Pass, for young people who are not in school. The program was expanded in 2016 to include riders up to age 25 who receive public benefits or meet job-training requirements. “I use it for food, or to help my parents pay rent,” said Adela Gonzalez, a 20-year-old Chelsea resident. She is a Youth Pass user and helps distribute them for the nonprofit group GreenRoots. “For me, it adds up, having the extra $50,” she said. Massachusetts officials have batted around the idea of a discount for years. Shortly after T service collapsed in the winter of 2015, Transportation Secretary Stephanie Pollack floated a radical restructuring of fares that included reduced prices for low-income riders. The T has also suggested the new fare-collection system coming in 2020 could make it easier to use different fare structures, because each fare card would be linked to a rider’s personal account. Monica Tibbits-Nutt, a member of the T’s governing board, said the issue is overdue for debate. “I find it inconceivable that we wouldn’t talk about low-income fares,” she said. When it raised fares in 2016, the T’s oversight board ordered a brief review of various low-income discounts, “in order to allow for means testing before fares are increased again,” according its records. On Thursday, MBTA spokesman Joe Pesaturo said that as the T installs new fare technology in 2020, it will review how discounts could affect ridership and revenue. Activists feel emboldened by a recent agreement in principle in New York City to subsidize fares for as many as 800,000 residents who live below the poverty line. Beginning in January, those who are eligible would be able to ride New York subways and buses for half off the $2.75 fare, according to published accounts. New York would join a handful of other US cities where low-income riders get discounts, including Seattle and San Francisco. “We’re seeing this happen in cities that have had incredible development the last couple of years, but also staggering income inequality,” said Andrew McFarland, community engagement manager for the Livable Streets Alliance, a Cambridge-based transportation advocacy group. He and other activists point to the Youth Pass as a potential model for a broader low-income discount. Riders 18 to 25 years old in Boston and a dozen suburbs who receive benefits such as food stamps or MassHealth are eligible for half-price fares. About 2,250 riders get discounted trips with the Youth Pass. Boston Mayor Martin J. Walsh’s long-term transportation plan, called Go Boston 2030, also calls for reduced fares for low-income residents. Vineet Gupta, a Boston transportation planner, said the city hopes to work with the state to establish a program, but acknowledged it’s in “the incubation stage.” There have been no discussions about funding. Jon Orcutt, advocacy director for the national organization TransitCenter, said that determining who will shoulder the costs is one challenge of expanding discount programs. New York, for example, would provide the subsidy with city funds, not the state-run Metropolitan Transportation Authority. In Massachusetts, the idea has some surprising supporters — and opponents. Charles Chieppo, a senior fellow at the Pioneer Institute, which typically calls for the T to tightly manage its finances, said he likes it. He noted many riders have been pushed out of the city by high housing prices and into longer, more expensive commutes. The T could offset the low-income discount by raising other riders’ fares. James Aloisi, a former state transportation secretary and transit advocate, worries split fares could backfire if higher-income earners switch to cars. “Once the differential between a T fare and an Uber fare becomes lower, you’re just forcing people who are riding the T by choice off the system,” he said. He’d prefer that the T consider another option: Riders who can’t afford the upfront cost of a monthly pass but spend more than that buying repeated single-day fares would have their monthly outlays capped at $84.50.